Health Related Products/REALASTIC is excited to announce improvements to several of its silicone products. The silicone finger now has a more "true-to-life" appearance for both the skin and the fingernail. Priced at a reasonable $500, this product fills a much-needed gap in the pricing of silicone finger products. 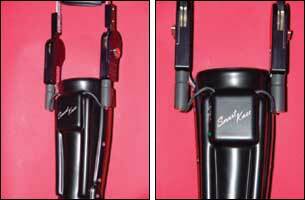 Prosthetist and patient response has been overwhelmingly in favor of this product change. 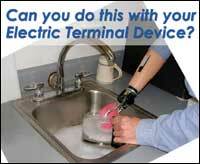 The company's silicone production gloves are available for all mechanical and passive prostheses. These gloves are durable and stain-resistant. These gloves will not fade, harden, or discolor. A great value at $175, these gloves are quickly replacing the vinyl gloves among regular users. Your patient absolutely will not tolerate a traditional, rigid spinal orthotic, yet needs the support and intimate fit of a custom device. What do you do? Introducing the "Ortho-Light" by Spinal Solutions. A soft, lightweight orthotic that combines the supportive features of a rigid orthosis and the soft, comfortable values of a corset. 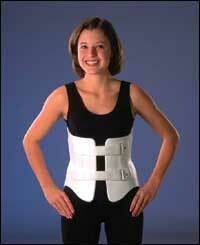 The orthosis features a supportive, semi-rigid, outer layer and a soft, thick, inner liner. Sandwiched in-between is a rigid support frame that can be fabricated in a variety of materials and thicknesses. The support frame has windows cut for relief of the a.s.i.s., spine, and any other area of need. The combination of lightweight materials and relief cutouts makes this orthotic 30 percent lighter than a standard brace. The orthosis is available as a LSO or TLSO and can be fabricated as an anterior opening or bivalve. 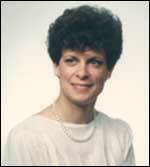 This is also an excellent choice for patients who have prominent bone structures. Need a softer, more forgiving orthotic? Give the Ortho-Light a try! The VariGrip III Multi-Device Controller for powered upper-limb prostheses is the latest in microprocessor-based prosthetic technology from LTI. This programmable controller operates up to four devices using a control strategy tailored to the user. The system adapts to the patient, thus reducing training time and increasing functionality. The VariGrip III is universal, enabling it to operate prosthetic devices from various manufacturers. It is small and light weight so it can be concealed in the prosthesis for improved cosmesis. 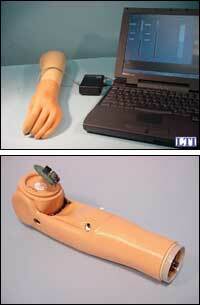 Since it is programmable through a PC, the prosthetist can quickly adjust or re-program it. 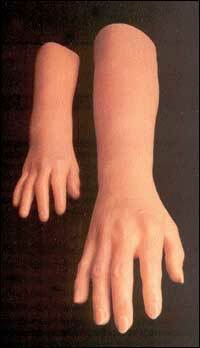 The new Boston Digital" Arm is an advanced prosthetic system employing microcomputer technology and state of the art components. It is actually a "platform" for controlling all manufacturers' upper-limb prosthetic devices such as hands, grippers, wrist rotators and shoulder joint actuators. It can control up to five devices and operates with a variety of input sensors, including: myoelectrodes, Touch Pads", positional-servo transducers and simple switches. It can also provide feedback to the user. Various control strategies can be downloaded from a personal computer and patient-specific adjustments are made through the proprietary software. Ossur is introducing a new, comprehensive range of adapters expected to set the industry standard for weight, weight tolerances, and appearance. Prosthetists have trouble finding adapters for their customers because of weight tolerances. Now they have a range of products that are rated to 365 lbs. 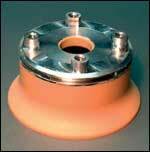 Ossur Standard Adapters have the highest weight tolerances of all adapters on the market. Unlike competing products, which are rated to 175 lbs. and 275 lbs., Ossur Standard Adapters are rated to 220 lbs. (aluminum) and 365 lbs. (titanium), saving money and decreasing the weight of the prosthesis. 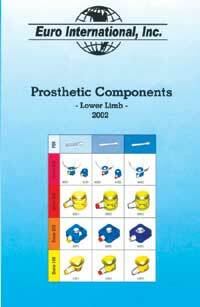 Euro International announces the release of its full-color, 115-page Prosthetic Componentry Catalog. This new catalog includes hundreds of products, all including color photographs, technical descriptions, and more. Most components are available in aluminum, stainless steel and titanium. 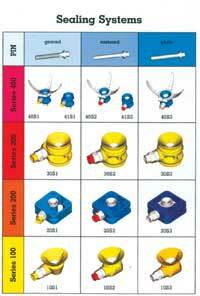 The catalog also includes a separate section for the various liners Euro International offers. Euro International offers 10 different silicone liners from low to high activity levels. In order to create a more secure connection between the liner and the prostheses, Euro International offers sealing systems that are optimally suited to the patient. 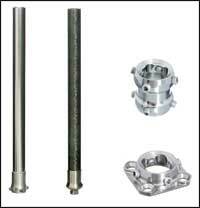 The difference with these sealing systems lies with how the pins lock and with the structure of the casing. A prosthesis can therefore be adapted to perfectly meet the requirements of the patient in the liner locking area and its structure can also be optimally adapted to the structural system of the technician using different casings. All locking units can be removed in their entirety when rectifying a fault or for the purpose of cleaning and substitutes can be delivered. Some types of locking units, for example a clutch lock, fit into all four clutch lock casings such as 10S1, 20S1, 30S1 and 40S1, therefore helping to minimize stock keeping. All sealing systems are supplied fitted with the necessary dummies and laminating aids as well as with handling information for simple and safe handling and can be combined with all liners. Motion Control Presents the New "ETD"
The latest Electric Terminal Device from Motion Control integrates water-resistant housings with a classic functional hook. The ETD also features a quick-disconnect wrist, rugged motor, wide-opening fingers, and a patented safety release. Flexion wrist and ProHand (controller inside) options are available. The water-resistant housings make the new ETD ideal for activities such as working in the garden, sports, and household chores. The patented safety release feature allows the wearer to quickly release the fingers in an emergency. Motion Control is now placing field trial beta units of the ETD. After three years of research and development, Ohio Willow Wood introduces the Alpha" AK Liner! From the beginning, this liner has been designed with one primary goalproviding comfort to above-knee amputees. 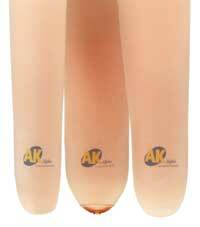 The Alpha" AK Liner is not simply another bigger below-knee linerthis is a whole new concept! A customized gel pattern that eliminates the need for a prosthetist to build padding into the socket. The gel pattern protects the often tender lateral side near the femur and at the distal end, while thinning dramatically proximally. A unique Alpha" AK Liner fabric was selected to provide flexibility, allowing easier donning and doffing of the liner, plus enhanced comfort. The Alpha" AK Liners are available in various size options for the variety of AK shapes. Now your patients who always wanted to try the Pathfinderbut didn't have the clearancecan experience this award-winning dynamic response energy storing prosthetic foot. The Low-Profile Pathfinder incorporates the same alignment theories, design elements, and physical benefits as the original Pathfinder, but it is 1-1 1/4 inches shorter. This extra clearance allows you to fit the Pathfinder to patients who have longer residual limbs or eight inches or more of clearance. To avoid interrupted, slow, and low reimbursements and financially threatening poor audit results, your practice needs efficient and reliable billing, compliance, and accounting functions. Complete Professional Office Services (CPOS) provides your practice with state-of-the-art, fully staffed billing, compliance, and accounting functions. We are being continuously educated on all new documentation, billing requirements, and compliance issues being instituted by Medicare and HIPAA. Horton Technology Inc. is pleased to introduce an electronic version of the "Stance Control Orthotic Knee"" joint. At the annual AOPA meeting in October, polio survivor Paul Ellis demonstrated how the Smart Knee®, which can be powered for several days by ordinary AA battery cells, enables him to walk up and down ramps safely despite knee paralysis and profound weakness in both legs. Stance control orthoses prevent the knee from collapsing as the patient walks, automatically releasing to permit unimpeded knee flexing during the swing phase of gait. Horton's electronic Smart Knee® is currently undergoing final clinical trials in the United States and will be commercially available in early 2003. 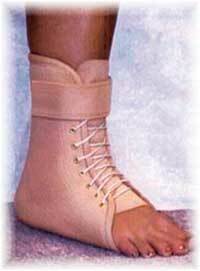 New Options Sports introduces the Cooper II Ankle Support, invented by Ron Cooper, MS, ATC. This support features two simple stirrups which originate from the user's forefoot. 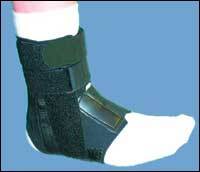 Its unique features will provide prevention for chronic sprains and management of acute sprains. Sizes from XS2XL, according to shoe size. US Patent No. 50506210. Suggested HCFA Code: L1906.